Brandon Marshall has not exactly been known to have the best attitude. He has gotten in trouble with coaches and management a few times in his career. Despite putting up league leading numbers as a wide receiver for the Denver Broncos, problems with coaches and his contract led to the star wideout being shipped out to Miami. While on the field and in the locker room it seems that Marshall has settled down and is staying out of trouble, off of the field and out of the locker room it seems to follow him still. This weekend, an incident occurred in Marshall’s home in Southwest Ranches, Florida. The Miami Dolphin superstar got into an argument with his wife Michi Nogami-Marshall in their Florida home. As the argument escalated, Michi grabbed a kitchen knife and stabbed her husband in the stomach. The Broward County, Florida sheriff’s office said that Marshall was in stable condition and the wound was not life threatening after the NFL player was treated at a medical facility. Michi Nogami-Marshall was released from the county prison in Fort Lauderdale after presenting bail in the amount of $7,500. As a result of the incident, Harvey Greene of the Miami Dolphins said, “Our thoughts are with Brandon at this time. We will look into the matter, but because we are not allowed to have any contact with any of our players, we will refrain from making any further comment.” The Dolphins are not allowed to contact Marshall during the NFL lockout. Marshall has been married to his wife for one year now. When police reported to the scene, Marshall told them he “slipped and fell onto a broken glass vase.” But there was no blood where the damaged vase was in the home. The case remains open. Marshall’s wife is being charged with aggravated battery with a deadly weapon for the time being. 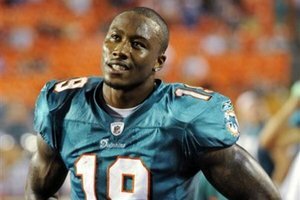 If Brandon Marshall’s description of how the wound was an accident is any indication, he is most likely hoping that the charges against the women he has been with for over two and a half years are going to be fully dropped. More information about what occurred on that day will come out as the investigation continues. In the coming days it will become clear whether or not Michi Nogami-Marshall will be charged or not.